USAG Bavaria Garrison Commander Col. Lance C. Varney receives the guidon from Command Sgt. Maj. Robert G. Todd at the change of responsibility ceremony Sept. 27, 2017. GRAFENWOEHR, Germany — Command Sgt. Maj. Robert G. Todd relinquished his position as the Command Sergeant Major for U.S. Army Garrison Bavaria to incoming Command Sgt. Maj. Micheal D. Sutterfield at a change of responsibility ceremony here Sept. 27, 2017. 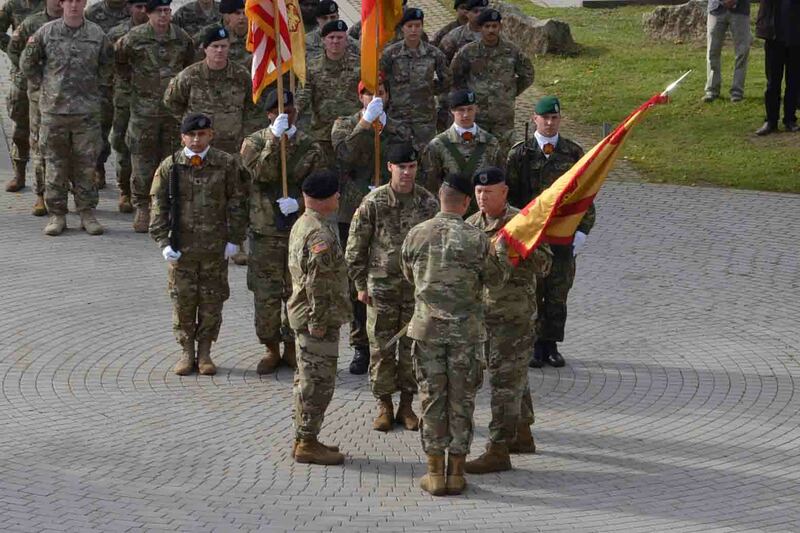 Leaders from major U.S. military commands and representatives from units as far as Belgium traveled to the home of Army Europe readiness to bid farewell to Todd and honor his storied military service. Senior staff and community members alike also came to welcome Sutterfield, a seasoned leader with previous experience overseeing commands in Europe, to his new position at the continent’s prestigious training site and most populous footprint. Todd, who has built a coalition of senior leaders at every command level and initiated tens, if not hundreds, of unit and community improvements, leaves behind a legacy expected to long outlive his tenure, said Varney. Former Marine and National Guardsman, Todd left his home state of Texas in 1985 and began his busy 32-year military career on the shores of California. In June 1991, he joined the Army’s active-duty ranks as an armor crewman and completed several combat deployments in support of Operation Iraqi Freedom. In his two years here, Todd assisted in the garrison’s integration of rotational forces and provided guidance to garrison stakeholders, tenant units and community leaders during significant changes to the installation’s operational front, Varney said. He provided sound counsel to the command group and, through example and guidance, carried each pillar of the garrison long range plan from infancy to fruitful victory. For six months — from January to July 2017 — Todd was hand-selected to act as interim command sergeant major for the 7th Army Training Command, a job he executed seamlessly while managing his responsibilities at the garrison, Varney said. In one form or another, Todd’s approachable leadership style and his genuine care for Soldiers and families ultimately touched the lives of over 50,000 community members. Sutterfield, gleaning from his years of experience in leadership and Soldier development, said he is excited to take on his new role as senior enlisted advisor for an Army community growing in size and influence. “I look forward to working with, by and through each and every one of you, our organizations and our communities to continue to grow our partnerships and relationships — all while building our readiness,” Sutterfield said. An aviator by trade, Sutterfield joined the Army as a young private. Most recently, however, Sutterfield served as the sergeant major for the operations division of the 21st Theater Sustainment Command, a unit with mission command elements and sustainment operations across the world. To view more photos from the event, visit the USAG Bavaria Flickr album here.